DOES buying gold make sense for investors wanting diversification for their portfolio? Historical data show gold acting as "investment insurance" – a simple tool for smoothing your risk and return, and reducing your overall losses when stocks, bonds or real estate fall sharply. Research into asset allocations with gold show it working time and again to hedge investment risk. Gold has positively boosted overall returns during longer periods of weak stock markets. Use this tool to see how adding a little gold to a standard portfolio split 60:40 between equities and bonds would have affected your risk and reward across the last four decades. As with any insurance policy, this protection has come at a small cost during the good times. But no-one cancels their home insurance because their house didn't catch fire. For investors holding gold over the last 40 or 20 years, the "premiums" on this investment-risk insurance have been paid in the form of slightly lower overall returns across the long term. You could try to side-step this cost by only buying gold before it goes up – and before other assets fall – and vice versa. But you can't know in advance how any investment will perform over the next week, let alone the next year or longer. Nor can you know for sure when you will need to access and spend the value of your investments. You may, perhaps, need to sell just when the stockmarket takes a big hit. Only by owning a range of different assets can you reduce the cost of this uncertainty on your savings and spending power. Spreading risk like this is known as diversification. At the simplest, it means owning two different assets, rather than putting all of your money into just one. Because without diversifying, you would risk losing everything if that one investment collapsed. Many of the "model" portfolios used by financial advisors today start from a simple mix of 60% equities to 40% bonds. To maintain that allocation, they will advise you to re-balance your portfolio every so often, perhaps once a year. Sell a little of what has delivered strong returns to buy more of what fell, so that the ratio between stocks and bonds again stands at 60:40. Otherwise, your diversification will change, and your insurance will weaken, as the different assets you own rise or fall at different rates. Many investment advisors will then recommend that you do not buy gold. Because unlike shares and bonds, gold does not pay any income. (It is a "non-yielding asset" in financial terms.) That means you must rely on gold prices rising to give you a gain. But it also means gold prices don't behave like equity or fixed-income bond prices either. Non-correlation: Gold prices don't tend to move in the same direction as other asset classes, helping reduce the impact of sharp losses elsewhere in a portfolio. Indeed, across a matrix of 17 major asset classes only the US Dollar, 3-month Treasury bills, US government bonds and corporate US debt show smaller week-to-week correlations with all the other assets than gold does over the last 5 years. Positive skew: Unlike the stock market, gold prices tend to rise faster than they fall. Coupled with its low-to-negative correlation, that means gold has worked quickly in the past to reduce the overall impact of sharp losses on other assets in a portfolio. Deeply liquid: Physical bullion is one of the deepest, most heavily traded asset classes. If it were a currency, it would represent the fourth largest FX pair in the world. Starting in Asia and ending in the US, trading runs almost 24 hours a day Monday to Friday. Live dealing on BullionVault continues all through the weekend as well. Global demand: Gold enjoys a uniquely wide and varied user-base worldwide, from investors to electronics manufacturers and central banks, with a series of seasonal events spurring consumer demand from engagements and weddings to Diwali, Christmas to Chinese New Year. No currency risk: While we tend to think of gold quoted in Dollars, it doesn't rely on the US currency for any of its value. Instead, gold holds value against all currencies directly, making it highly useful for protecting against currency crisis or sharp inflation. The table above shows the impact of adding gold to diversify a simple portfolio of US assets. It measures total returns (ie, both capital and income from stocks and bonds) but doesn't account for dealing or management costs, nor any tax. Holdings are rebalanced every New Year, so that each allocation's commitment to stocks, bonds and gold is maintained. As gold is added, the 60:40 split between equities (here using the S&P500 index) and bonds (10-year US Treasury bonds) is kept at the same ratio across all three allocations. As you can see in the data above, adding gold to this simplified portfolio of US stocks and bonds would have reduced losses in the worst year of the last four decades (2008). It would have positively boosted returns during the worst 5-year period too (2000-2004). The more gold, the lower your risk – and the greater your rewards when other assets failed to perform over extended periods of time. On a retirement portfolio of $1 million, adding 10% gold would have reduced losses during the worst year of the financial crisis by more than $17,000. During the Tech Stock Crash, holding 10% gold as "investment insurance" would have boosted a US portfolio's total returns by almost 0.7 percentage points per annum, adding nearly $40,000 to initital savings of $1m. Will gold work to insure US portfolios like this again in the future? Nothing is guaranteed. You can also see the small cost to investors of buying gold to hedge their portfolio risk, paid in the form of slightly lower total returns. Over the four decades ending 2016, the total return on a portfolio with 10% gold would have shown compound annual growth of 9.7%. That was just 0.1 percentage points per year below the total annual returns of a portfolio holding 60:40 stocks-to-bonds with no gold. The same pattern of lower risk at a small cost to overall returns shows across the last 40 years for UK investment assets. The value of gold as investment insurance has been greater still for hedging UK assets over the last 40 and 20 years. Going 10% gold almost halved the losses of 2008 on a simple 60:40 portfolio of UK equities and government bonds. Going 25% gold reduced that risk still further. 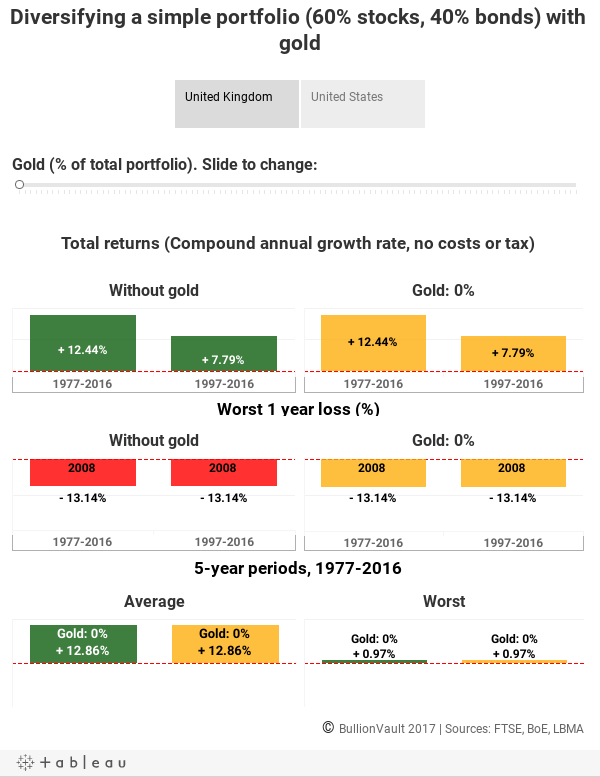 Longer-term, buying gold has made UK portfolios a little more volatile, cutting the overall annualized rate of return since 1977. But because the first rule of making money is to avoid losing it, buying gold has paid better returns overall during the last twenty years, when investors were hit by the DotCom Crash, the collapse of interest rates, and then the global financial crisis starting with Northern Rock's failure in 2007. BullionVault's analysis shows that a portfolio holding gold alongside a split of shares and bonds would have performed better since 1997. Again, as with the US table above, these calculations assume that each portfolio is re-balanced every New Year. Again, the figures don't allow for taxation or trading or holdings costs – and minimizing your investment expenses is vital. Because otherwise, the savings you make from diversification risk being eaten up. Buying gold to spread your portfolio's risk needn't be expensive. It can be done cheaply, safely and easily using BullionVault.